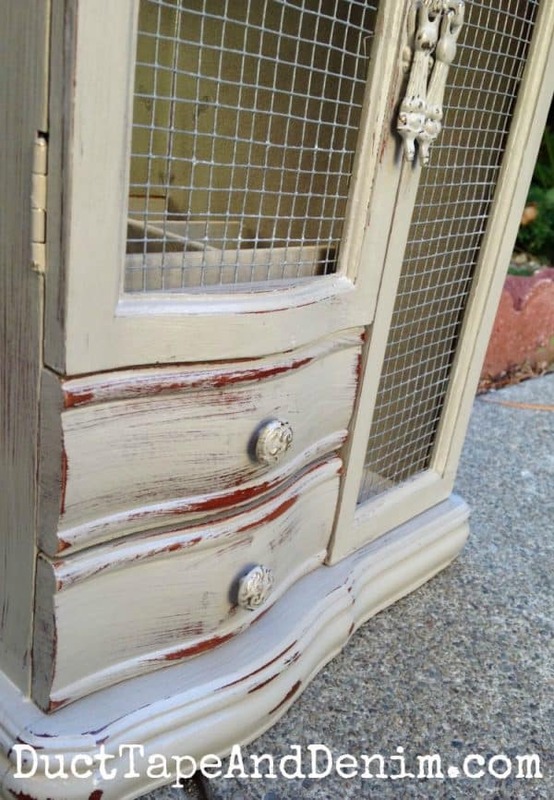 This painted jewelry cabinet with hardware cloth was one of my favorites that I updated last year. I was so excited about painting it that I forgot to take a before photo of this one! This jewelry cabinet was in pretty good condition, just a few scratches on the surface. I didn’t have to do anything to the felt inside but I didn’t like the fake stained glass in the doors so I replaced it with hardware cloth. I used CeCe Caldwell’s Seattle Mist for this project, finishing it off with Minwax Polycrylic. Here it is displaying jewelry on my shelf at Paris Flea Market. It sold that weekend! Leave a comment and let me know how you organize your jewelry. You may like my next jewelry cabinet project… I’m going to try frosting the glass! If you don’t like the chicken wire or the faux stained glass, I have had pretty good luck just taking a single edge razor blade and scraping off the design on the glass. If any residue remains, wipe it down with some lacquer thinner. I love the look of this made-over jewelry cabinet. I can’t tell if the paint is somewhat metallic or not. Or is it a flat shade of grey? I have several jewelry cabinets that I have purchased at thrift shops with the intent of making them over but have been hesitating to start one. I guess I’m afraid of messing it up! Anyway, I’m inspired by the look of this one that you did. So maybe I’ll get brave and just go at it! I suppose if it turns out looking awful I can always redo it, right? I’ll be back to look at more of the ones you’ve done for ideas, too. Thanks for the inspiration! Thanks, Naomi… this paint was just flat. But I have some metallic paint and a few more jewelry cabinets to do… stay tuned!